From the kitchen of One Perfect Bite...It's baaack! While I'm not sure it ever went away, there was a long stretch of time when no one would admit they still ate this classic American salad. I speak, of course, of wedge-shaped iceberg lettuce that's been cloaked in the folds of a creamy dressing. The salad first appeared in the 1920's, but the height of its popularity came during the 1950's and 1960's when it was a standard feature on dinner tables across the country. There are few dishes easier to make and I'm fairly certain that its popularity coincided with the appearance of bottled salad dressings on supermarket shelves. While the preference these days seems to be for blue cheese, in those early years Thousand Island was the salad dressing of choice. I am a traditionalist and wouldn't dream of serving this salad with anything other than the ubiquitous salmon pink dressing. That, however, is where my homage ends. This dressing bares no resemblance to the one that was popular in the fifties. It carries with it a touch of the Orient and enough other ingredients to set your palate singing. I really think you like this. You'll need four wedges of iceberg lettuce to make this salad. Don't cut them until you are ready to dress the salad. Lettuce browns quickly when cut with a knife, so don't get too far ahead of yourself. This is the recipe I use to dress the salad. Whisk together mayonnaise, ketchup, chile paste (if using), pickles, and olives in a medium bowl. Dressing can be refrigerated in an airtight container up to 1 week. Yield: 3/4 cup. Labels: condiment , iceberg , salad dressing , thousand island , wedge salad. Thanks, Mary. I was just wanting a homemade thousand island recipe, for reuben sandwiches. Why don't we still serve the lettuce wedge? It saves a lot of chopping and it looks really pretty. Thousand Island is the best dressing out there!! This is my favorite salad dressing. However, I do not recall the presence of olives in it. I'll just have to give it a try. My husband has noticed many restaurants serving a lettuce wedge again...especially in NYC and Las Vegas. It's back in style...yea! thank you so much for posting on my blog. I love thousand island dressing, especially in the summer! I've noticed the return of the wedge up here, too. A good Thousand Islands dressing is a treat! Yummy! I love to have thousand island dressing on my burgers. Ahhh... I could just bite into that. I have always loved salads served in a wedge that way. Thank you for reminding me to do tht for my family tomorrow. Too funny! I remember slicing up crunchy iceberg lettuce to make my own shrimp cocktails (with the ketchup and horseradish sauce) and loved it! And my older son LOVES Thousand Island dressing so I am going to show him this recipe and I am sure he'll make it! I love Thousand Island Dressing. I thought I didn't like thousand island dressing, until a friend hounded me to try it...this looks really good! I love that you post information like the history or tradition-I didn't know about wedges or the history of salads...thanks! I've ordered this dressing a number of times at restos...and yet, never made one of my own...hmmm. Still not a big fan of iceberg...sorry. I think I'll be having me some thousand island salad dressing real soon...tasty ingredients all around. Nothing beats homemade dressing! And yes, growing up, it was thousand island! It was company fare growing up -- not everyday fare! Great minds think alike Mary! I am doing a version of this next week... it was so good with homemade mayo... a forgotten treasure to be sure!! I loved the picture with the iceberg lettuce... it really looked like a green iceberg looming up... wonderful shot! I love this salad and for me the homemade dressing is so much better, and easy to make, I refuse to eat the bottled version. I did a post on Feb 28 that gives a little of the history of the dressing - such as why the name. Mary, if you ask my Dad, this is the best salad there is- no "rabbit food" for him! :) Memories..... And why DID it go away?? This is the salad of choice for my Ole Sweetie-Pi. I haven't made thousand island dressing since my home ec days. Time to make this wonderful dressing again. Thanks, Mary. It's a delight to see this spotlighted. 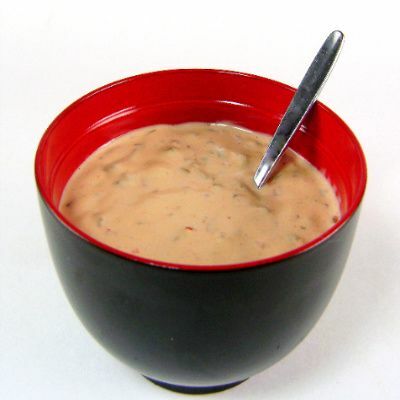 Mary, Mike has always liked Thousand Island Dressing and I have a Creole version of it that I make for him. Thanks for this new take. I will give it a try. It's interesting how iceberg wedges for salad seem to have gotten a new lease on life the last couple of years in restaurants. Happy Pink Saturday! Ah Mary! Sometimes we disagree. That's what makes the world go around, no? I can't (won't) eat iceberg lettuce, and Thousand Island dressing just reminds me too much of diner food- even though I like how you jazzed it up.I would eat it on a sandwich, but for a salad? We eat our salad last and it just seems too strange to put a sweet dressing on it.I'm a stubborn Italian man, what's to say? We haven't had this dressing in a long time and your version sounds delicious! Nothing like a wedge of dressed lettuce! Thanks and you have a good weekend, Mary! My husband loves Thousand Island Dressing and Iceburg lettuce! I haven't made it in awhile, but you have inspired me to make it for him and he will thank you forever!! There use to be drive-in near my childhood home and they served french fries smothered in this dressing - Yummy! Thanks again, and Happy Pink Saturday! It has been a while since I have had a wedge salad with thousand island dressing - but now I am just craving one. I do love a good reuben sandwich with this dressing also. Perfect recipe! HAVE A GREAT PINKY SATURDAY!!! Hi Marry. Happy Pink Saturday. This looks super creamy and delicious. Have a wonderful weekend. That looks so yummy! My mother used to make our homemade salad dressing very similar to that. I don't eat it that often any more, but maybe for old time sake we'll try some this weekend. Blessings and Happy Pink Sat. Thank you for this recipe...and what pretty pink pictures! I love making my own dressing. So much better than what you can buy at the stores. And I love lettuce wedges...such an attractive way to display such beautiful dressing. This salad brings back childhood memories! My mom would make wedge salads at least once a week. I love the dressing recipe! That looks so easy Mary! Thank you for all your well wishes! I was always such a huge fan of this dressing growing up and it has been so long since I had it last. I need to change that! I do still love thousand island dressing. Besides you can't have a reuben without it. This one sounds very interesting. Definately not your typical version. haha I was never even aware that this "left" as my parents still eat it as their sole vegetable source. I'm loving the homemade dressing though...everything is better homemade! Dressing sound fabulous and yumm! Just found your blog and see lots of yummy things some are even PINK like today's post. I love eating PINK food and you will see why if you visit my blog Marie Arden Pink Living- my passion about happiness thru pink living. I will be back for more yummy inspiration. Happy PINK Saturday!! Mary, I hold my head high and say I like thousand island dressing. I use it to dress our rolls when we have salmon burgers. I use a variation of it for shrimp salad and, sometimes, I use it on my luncheon salad. And I'm going to proudly use your recipe and make my own!! Yum! It's funny how delicious some Thousand Island Dressing can make a big wedge of lettuce taste! I never tasted this American dressing before in my life. now, i can with this tasty dressing of yours!! I have got to try this out. Can I say that I love the way you write? Oh Mary...this was my father's favorite. He asked for it every time. 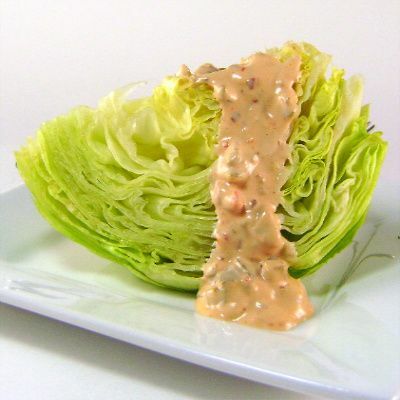 Iceberg lettuce and thousand island dressing. I can just hear him. What's funny is we used to raz him about it and now it's making a big comeback. He's having the last laugh! Well now, I never thought about how to make the dressing...I've always purchased it premade. Cool! Ohhhhhh yummmmmmmmm!!!! This is still my husband's favorite salad and always with Thousand Island..but I fear its straight from the bottle..*sighs and hangs head.. Your's as always, looks so super delicious.. Happy Pinks and have a beutiful week.. Yummy!! MY Dad would always mix 1000 Island and French dressing together on his salad! You brought back a sweet memory for me. Wow - you've shaken this recipe up! I'd Thousand Island PLUS! If you have time, stop by my Pink Saturday post to see some upcoming blog parties. You are taking me back thirty years with this salad! I used to eat it all the time when I first moved to the US and now I am in the mood for it out of sheer nostalgia! Thank you for stopping by my blog to pay me a visit and for the very kind comment! I truly appreciate it. Your photos are gorgeous and this wedge of Iceberg looks simply delectable. Sounds great! I had a wedge salad in a restaurant not too long ago, but it was indeed served with blue cheese. I will have to try this recipe; I do like Thousand Island dressing. You know, I never had a wedge shaped salad...I'd love to try it! Dear Mary - This will always be my fave salad dressing especially with some jumbo prawns! Yum! I've never made thousand island dressing. What a beautiful topping for the green lettuce. Great Pink Saturday post, too! Lettuce is just a vehicle for having thousand island dressing. This one looks superb. My husband loves Thousand Island Dressing, and this sounds almost exactly like I make mine - with the exception of the oelek. I will try this for certain. Do you find the oelek at your regular grocery store, and in what section? I have a friend that makes Thousand Island Dressing with chopped boiled eggs in it. I had never had it that way before, but it is pretty good. I'm a big fan of Thousand Island dressing, probably because I love ketchup. I'm not sure why it gets such a bad rap among foodies.